5 applications of percentages in a fun online math learning game. "Percentage Calculator" is an interactive knowledge board, used to study 5 fields, where percentage is used. you get every month from your money in a deposit, click the "Deposit" icon. Type the money You saved in the most left green field. Then type the percentage the bank give on its brochure in the next green field. Click "Calculate"
and enjoy. Use this board to calculate various percentages, when it is needed. Learn where percentage is used. Part of the Fun Interactive Mathematics educational tools. What is a percentage of a number? For what are percentages used? What number is percentage of another number? What is number of percentage? How to find number of percentage? How to play Percentage Calculator. There are always 3 figures when calculating percentage. They are the Big number, the Small number and the Percentage itself. We may type two of this number and find the third one. This is done from the "hints" in the app. percentage is used. The two left green fields are where the numbers are typed. Just click there and use the keyboard. Then after clicking "Calculate" button, the value will appear in the third most right green field. Use "Next" button or the fields icon to do the rest of them. Know where percentages are used and how to calculate them. Calculate discount on products and services. Calculate bonus and gratis on products. 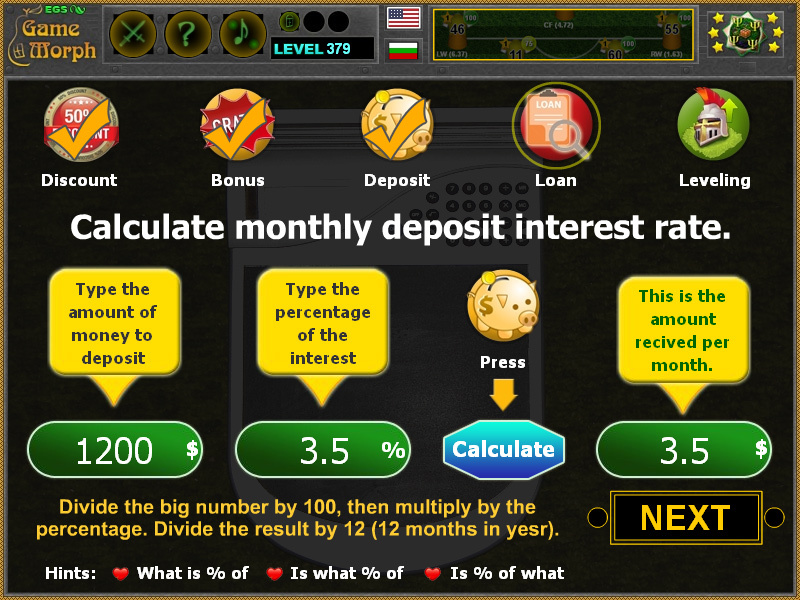 Calculate monthly deposit interest rate. Calculate the final loan return value. Labels: Games with Numbers , Imput Games , Flash Games , Math Games , Education Games , Free Online Games.